If you've already purchased songs and albums from the Amazon Music Store, then you probably already know that they are automatically stored in your personal Amazon cloud space -- otherwise known as Amazon Cloud Player. This is also true when purchasing physical music CDs that are AutoRip eligible. Amazon Cloud Player is a useful part of Amazon which lets you stream purchases and even download songs for offline listening. But, why create Playlists in the cloud? 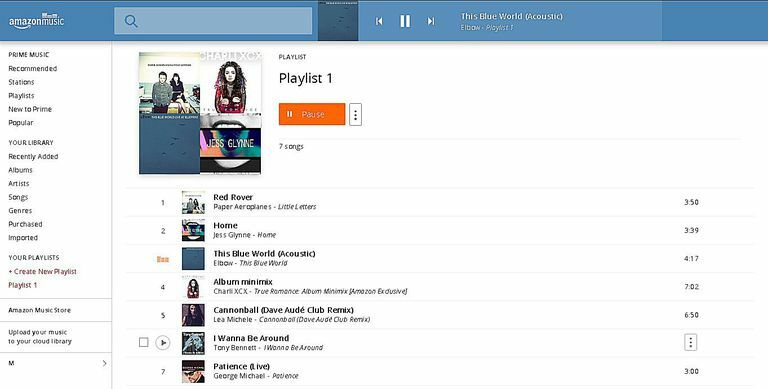 Just like playlists that you may have created in iTunes or another software media player, you can use them in Amazon Cloud Player to organize your music. You might want to create a genre-specific playlist or one that contains songs from your favorite artist. Likewise, playlists can make it easier to stream several albums in succession. They can also be useful for downloading multiple songs in one go. Sign in to your Amazon account in the usual way. Go to your personal Amazon cloud music space by hovering the mouse pointer over the Your Account menu tab (at the top of the screen) and clicking on the Your Music Library option. In the left menu pane, click on + Create New Playlist option. (This is located in the Your Playlists section). Type in a name for the playlist and click the Save button. To add multiple tracks to your new playlist, first, click the Songs menu in the left pane. Click the checkbox next to each song you want to add. When you've selected all the songs you want, you can drag and drop them by holding the left mouse button down over anyone in the group and dragging them all across to your new playlist. Alternatively, you can also click the Add to Playlist button (above the time column) and then choose the name of the playlist. To add a single song, you can drag and drop it to your playlist by holding the left mouse button down. If you want to add complete albums to a playlist, first click on the Albums menu in the left pane. Hover the mouse pointer over the album and click on the down-arrow that appears. Click the Add to Playlist option, choose the name of the playlist you want to add the album to and then click Save. If you want to base your new playlist on a particular artist, then click on the Artists menu in the left pane. Hover the mouse pointer over the name of your favorite artist and click the down-arrow. Choose the Add to Playlist option and then click the one you want to use. Click Save to complete the task. To make a genre-based playlist, click on the Genre menu and repeat steps 2 and 3 -- it's basically the same. If you haven't purchased anything from Amazon's online music store yet, but have purchased physical CDs in the past (as far back as 1998), then you might find AutoRip digital versions of albums in your Cloud Player music library. This is similar in principle to some movies on Blu-Ray/DVD which sometimes include a downloadable digital version. The main difference, however, is AutoRip content is DRM-free.